Your teen will remember this Halloween party forever. Whether you are planning a large Halloween party or a small get-together for your teen and her friends, a little planning can go a long way toward helping everyone have a good time. Follow some basic safety guidelines and encourage the teens to let loose and have a good time. Make sure your teen is involved in the party planning. After all, it's important to throw a party that your teen is excited about if you want her to have a good time. Before you begin planning the party, divide up the jobs. Decide what jobs your teen is willing to do and which tasks you're going to take on. Consider hosting the party in conjunction with another teen and parent. Then, you'll be guaranteed to have at least one more person to help with the budget as well as another adult to supervise the party. Discuss any rules you will have for your teen and their party guests. Make sure your teen is on board before you move ahead with your plans. It's possible to throw a great party at the last minute. Have your teen call some friends, tell them to show up in costumes and order pizza. But planning ahead for a few weeks can make for a better party. You'll be assured that more teens are able to attend and you'll have time to decorate and plan some fun activities. How large will the party be? Can you have it at home or do you need a bigger space? Secure the location. What day and time will the party be? What does your teen want? If you host the party in your home, you may want to use a small portion of the house only, preferably with direct access to the bathroom. Block off the rest of the house with spider webs, black sheets, or other decorations and make it clear that party goers should stay in the party area. Think about how much you want to invest in the party. Then, consider how much to spend on decorations, food, and activities. Remember that food can often serve as a decoration. For instance, Halloween punch with a floating frozen hand makes a great Halloween table decoration and glow in the dark bat decorations can be a "count the bats" party game too. Is your party going to be spooky or based on celebrities? While a theme isn't always needed, it can help you and your guests choose what to wear and set the tone for your party. A party theme can be as simple as "Ghoulish Gathering" or as specific as "Dead Rock Stars." Whatever your teen picks for their Halloween party theme is okay, as long as it is fun for everyone. After you set the date and time for the party, your teen will need to get invitations ready. While formal invitations used to be put in the mail, your teen may simply want to call friends or invite them over social media. If you choose to invite people more informally, beware that extra guests may show. A friend of a friend may hear about the party and want to attend. To help prevent that, tell your teen not to post a blanket invitation on Facebook or on social media. You'll want a good idea of how many kids are showing up ahead of time. Parents may also want to contact you to make sure you're going to be home or to confirm that there will not be any alcohol served. Others may want to offer to help make treats for the party. Once you have the big picture planned, you can begin to plan the smaller details of the party. Help your teen decide what he's going to wear. Make sure it's in line with the theme of the party if you have one. You also might decide that you and other chaperones are going to dress up too. Just make sure you have something that distinguishes you from the other guests. Pumpkin flashlights work well for this. 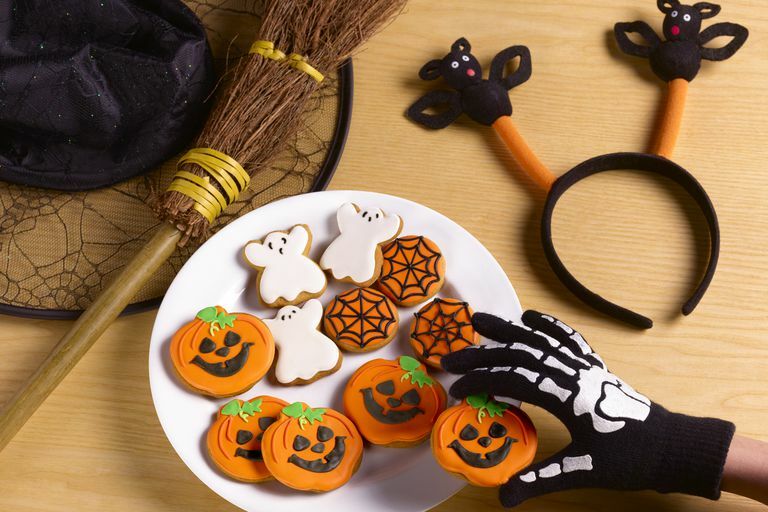 Are you planning to do make your own fun Halloween treats or you will be buying most of the goodies? Pick foods that you can prepare before the day of the party so you can free up time for decorating and costumes. Unless the kids will be eating sit down meal, stick to food that can be eaten while standing up That will encourage teens to mingle and walk around during the party. A food-related contest. Put on a pie eating contest or go bobbing for apples. Use a black plastic table cloth to keep the house clean. A fun apple contest. Replace bobbing by stringing up apples from the ceiling at different heights. See how fast your teens can eat the apple with their hands behind their back. Run a costume contest. Use categories like the most original costume, spookiest costume, funniest costume and best group costume. You might find you're able to use many objects you already have around the house to decorate. For example, holiday white lights can add to the eeriness of a party room. Some music can help set the stage too. Look for Halloween play lists that you can play during the party. Spooky music in the foyer can also set the mood. Spider webs, pumpkins, and inexpensive decorations can go a long way to helping teens have a good time. Make the lists by store (party store, grocery store, etc.) and write it all down. It is easy to forget the simple things and a pain to go back to the store for a much-needed recipe ingredient. Relax and enjoy the event. Help your teen greet guests and start activities. Chaperones should be around but not be obtrusive. Keep the food table stocked, the supplies for activities available. Assemble a clean up crew to help pick up after the event is over.